The Reaper expansion comes in one of FFGs small boxes which they have already used for small games or Arkham Horror expansions, and so the box does not contain any additional gameboard but instead three packs of cards, five character sheets and matching miniatures. One of the character sheets depicts the name-giving personality of the game - the grim Reaper. However, although the Reaper is present on the gameboard as a miniature he is no typical character because he is not played by a particular player. Instead, each time a player rolls a "1" for movement he rolls an additional dice when he has finished his own movement. He then is allowed to move the figure of the Reaper through the outer and middle regions for the amount of steps indicated by the dice, and it is the player's most prominent aim to place him onto a space containing another player's character. As might be guess, such a meeting with the Reaper is dangerous, and so a character who meets the reaper is required to roll a dice and to reference the result of his dice-roll with the results listed on the Reaper's character sheet. Notwithstanding the fact that there is a small chance for the player to reach a beneficial result, there is a higher chance that the visit of the Reaper has a detrimental effect. Thus, the results may be the loss of a round or even of a lifepoint, but the ultimative punishment is immediate death of the player's character. On first sight this may sound like it is too strong a result, but on the other hand it should be mentioned that the Reaper was introduced by FFG to increase interactivity in the game. To reach this effect, the Reaper must be fearful, because otherwise the players would simply ignore his presence and take it as a bare flesh wound if the worst thing which could happen was the mere loss of a lifepoint. In addition it should be remembered that players are allowed a re-roll if they spend a Fate marker, and so risk of a total loss can be minimised by taking out a "Fate point insurance" and by watching the movements of the Reaper. To my taste the Reaper does not really throw the game off balance, but he increases the number of instances when the players can influence each other, and so FFG really reaches the aims which they pursued. Another total innovation which is included in the expansion is a set of 12 Quest cards, and these cards can be used as an alternative to the 6 quests printed on the Warlock-space of the gameboard. Thus, the players now have new possibilities for quests in which they can obtain a Talisman by choosing one of the available quests instead of rolling a dice on the Warlock's table. However, the rule that a player actually can chose one of the remaining Quest cards is somewhat two-sided, since it allows a player to gain a Talisman much faster if a quest demanding something in his possession is still available. This devaluates the bigger efforts which the other players might undertake in order to get their quests. On the other hand the free choosing of a quest actually might lead to a bit more strategic gameplay, since a player might try to cover his back by fulfilling two or even more quests in a row in order to prevent others from getting a quick Talisman. The other playing materials included in the box are four characters (Knight, Dark Cultist, Merchant and Philosopher), Spells and Adventure cards, and all of these show a strong handwriting and revisioning of the FFG team. 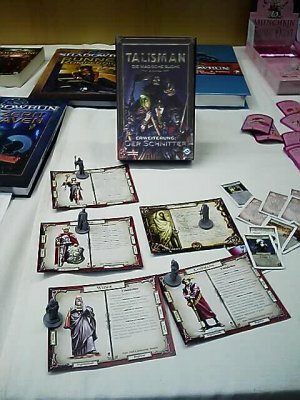 Seasoned Talisman players will discover some cards from the classic add-ons Talisman - The Expansion and Talisman - The Adventure, but not all cards from these expansions are included, and furthermore the text on many of the cards has seen some revisions. Some of the changes are concerned with the gaining and use of Fate markers, but other rules have been introduced to change cards which were considered to be too powerful. An example here is the Warhorse, since it now only allows the player to add his initial Craft rating to his combat roll, and furthermore it must be discarded if the player looses a lifepoint in combat. Overall, I consider the changes which were made by FFG to be generally beneficial to the gameplay in Talisman, although some of the rules-innovations like the aforementioned Warhorse certainly could be discussed whether they really are the most fitting approach. Over the years I have seen different solutions for difficult cards discussed on Talisman-fansites and in forums, and as it seems by the acknowledgements given in the rules FFG has consulted with some senior Talisman-fans like Jon New from Talisman Island during the creation of this expansion. Thus, I will take those cards as a combined effort to clear problems up which could be found in older editions of the game, and as such I generally welcome the effort which was made. What I really like in the expansion is both the Reaper-character and the Quest cards. With a minimum of new rules and effort both of these elements lead to an interesting new angle in a game of Talisman, and so they can be seen as a real gain for the Talisman-World.